It’s not rare for me to fall in love with cookbooks, but it is rare for me to want to make every recipe out of a single book. Which is just what Tessa Huff's (from Style Sweet CA), new cookbook, Layered - makes me want to do. (check out her blog, if you haven’t already)! I have always been an admirer of Tessa’s amazingly perfect cakes, and have been eagerly anticipating the release of Layeredfor some time. And I would just like to begin by saying how beautiful the book is. I am so enamoured by its glossy pages, decadent cakes and charming photography. This French Opera Cake is hidden among the pages of Layered, and it’s the one I was immediately drawn to. I have made several renditions of traditional opera cake’s in the past - but I do love how Tessa has turned the usually finicky french cake into a more user friendly version. It’s round but still layered - and it comes together like a dream. It holds all the flavours of the traditional opera cake too. I find it a perfect riff on the classic recipe. This cake - I tell you, is amazingly good. As you know, I do have a thing for espresso in baking - it seems to reign throughout my baking at the moment. The French Opera Cake is comprised of six light and fluffy layers of espresso flavoured sponge. 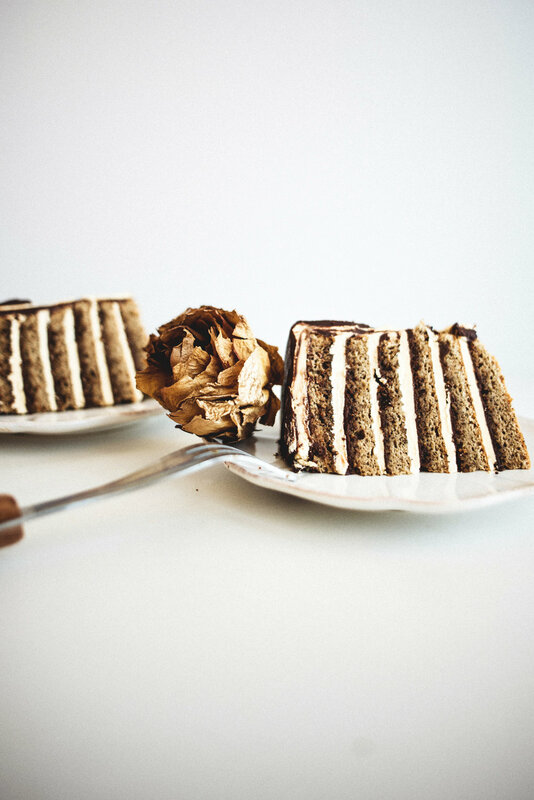 The cake layers are soaked in an espresso and liqueur spiked syrup then stacked into a sky-high tower, sandwiching alternating layers of dark chocolate ganache and coffee french buttercream. I also chose to adorn the cake with a drippy dark chocolate glaze and decorated the top with a gilded Colombian rose. Each bite of this French Opera Cake is a dreamy affair. The buttercream is sweetly light and compliments the smooth dark chocolate ganache perfectly. The espresso sponge layers are so soft by themselves and the addition of the espresso liqueur syrup makes them so moist too. I truly cannot get enough of this cake. It's delicious, moorish and addictive. 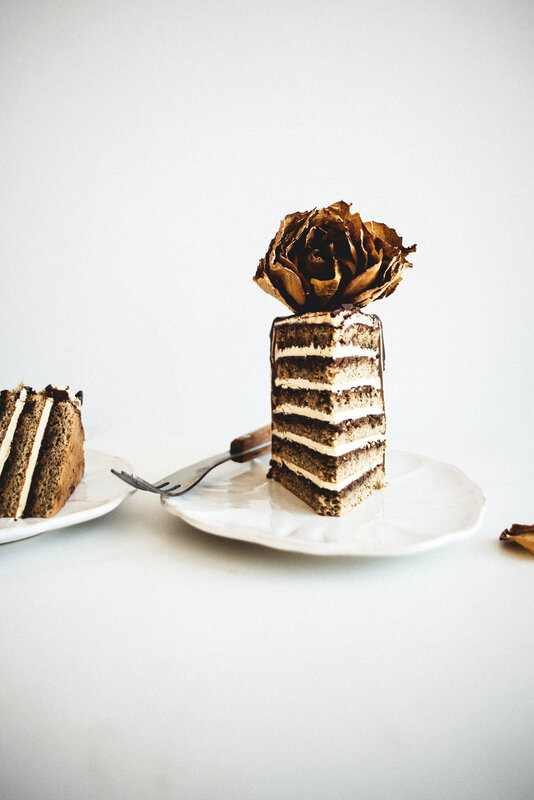 This French Opera Cake was created almost too easily and I cannot wait to try out all the other decadent cakes I have added to my hit list (hello, rhubarb riesling, and london fog!). I’m one to hold the opinion that you can never have too many baking or cake books, and Layered is one of my new favourites. If you too, love baking, and decadent cakes, I highly recommend adding Layered to your collection. I’m sure you will love it just as much as I.
Pre-heat the oven to 190 C (375 F). Grease and line three 15 cm (6 inch) cake pans. In a large bowl, use an electric hand whisk to whisk together the confectioners’ sugar, eggs and vanilla until the mixture is thick and pale ribbons have begun to form. Sift in the almond meal, flour, espresso, baking powder and salt then gently fold with a rubber spatula to combine. Stir in the melted butter. In the bowl of a stand mixer fitted with the whisk attachment, begin whisking the egg whites on medium speed until they begin to foam. Add in the sugar and cream of tartar in a steady stream and turn the mixer speed to high. Whisk until the mixture is glossy and stiff peaks have begun to form. Fold in half of the egg white bowl into the other flour and butter bowl to loosen. Gently fold in the remainder of the egg whites, being careful not to over-mix. Divide the mixture between the prepared cake pans then evenly spread out the tops with the spatula. Bake for 5 to 10 minutes, or until the cakes spring back when lightly pressed and a skewer inserted into the middle comes out clean. Let the cakes cool in their tins for 15 minutes before inverting out onto a wire rack. Once cool, level any domed tops and halve each layer, if desired. Combine the sugar, espresso and water in a small saucepan. Bring the mixture to a boil over medium-high heat, then reduce the heat to low and simmer for about 5 minutes. Remove from the heat and stir in the coffee liqueur. Let the syrup cool slightly before using. Pour the cream into a small saucepan and bring it to a simmer over medium-low heat. Remove from the heat and pour the hot cream all over the chocolate. Let the mixture sit for 1 minute before using a whisk to mix together until smooth and glossy. Let the ganache cool to room temperature, stirring occasionally, before using it in the recipe. Mix the espresso and hot water together in a small bowl until dissolved. Set aside to cool. Place the egg yolks in the bowl of a stand mixer fitted with the whisk attachment. Whisk on high speed until the yolks are pale in colour and doubled in volume. Meanwhile, place the sugar and water in a medium sized saucepan set over medium-high heat. Stir to combine. Heat the mixture until the syrup reaches 114 C (238 F) on a thermometer. Once the syrup is at temperature, remove the pan from the heat. Set the mixer speed to medium-low then carefully pour the syrup down the sides of the mixer bowl and into the whisking yolks. Increase the speed to high and continue mixing until the outside of the bowl has cooled to room temperature. With the mixer speed on low, add in the vanilla. Mix to combine. Increase the speed to medium and add in the butter, a tablespoon at a time, until it is all used up. Pour in the espresso, beat to combine and turn the mixer speed to high. Beat for about 30 more seconds, or until the buttercream is smooth, thick and fluffy. Set aside for assembly. Place the dark chocolate and oil in a medium heatproof bowl set over a pan of barely simmering water. Heat, stirring occasionally with a rubber spatula until smooth. Remove from the heat. Let cool to room temperature before using. Arrange the cake layers, cut side up, on two wire racks. Glaze the tops with the coffee syrup. Place the first cake layer, on a stand or serving platter. Spread a generous tablespoon of the ganache on top of it then set in the refrigerator or freezer to harden the ganache, about 10 minutes. Once set, spread about 60 grams (2.1 ounces) or two generous tablespoons, of the buttercream on top of the ganache. Sandwich with a second cake layer. Repeat this process, spreading with ganache, setting to harden in the fridge and then frosting with the buttercream until all the cake layers have been used up. Use the remaining ganache to crumb coat the cake and refrigerate until completely set. Once the ganache has set, thickly frost the top and sides of the cake with the remaining buttercream. Let the cake chill in the refrigerator for about 1 hour. Pour the cooled dark chocolate drippy glaze over the top of the cake then use a spatula to spread it out to the edges so that it pours down the sides. Place the cake back in the refrigerator to set the glaze before serving then decorate as desired. You can keep the cake in the refrigerator but before serving, let it stand at room temperature for 30 minutes. The cake will keep covered for up to 3 days in the refrigerator or for up to 1 day at room temperature.